His Honour M. A. Carrington (Chairman), Hon. D. J. H. Thompson, Hon. R. D. Jones and Hon. Miss M. A. Mottley, Q.C. Hon. F. J. Stuart, Hon. M. A. Lashley, Mr. D. St. E. Kellman and Mr. D.D. Marshall, Q.C. His Honour the Speaker (Chairman), Hon. M. A. Lashley, Mr. D. St. E. Kellman, Mr. A. D. Brathwaite, Dr. the Hon. D. S. Lowe, Dr. W. F. Duguid and Mr. H. F. Lashley. Hon. Miss M. A. Mottley, Q.C. (Chairman), Hon. R. L. Sealy, Hon. Dr. D. C. Estwick, Hon. C. P. Sinckler, Dr. the Hon. D. S. Lowe, Mr. D. D. Marshall, Q.C. and the Hon. O. S. Arthur. C. Best, Dr. the Hon. E. R. Byer-Suckoo, Hon. J. D. E. Boyce, Hon. S. D. Blackett, Mr. S. A. Lashley, Mr. G. W. Payne, Q.C., Mr. R. St. C. Toppin and Mr. R. C. Eastmond. Dr. the Hon. D. C. Estwick: To move the Second Reading of the Barbados Water Authority (Amendment) Bill, 2008. Notice of this Bill was given on 17th April, 2008. The Bill was read a first time on 22nd April, 2008. The Bill first appeared in the Official Gazette on 28th April, 2008. 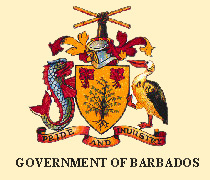 Barbados International Business Promotion Corporation (Amendment) Bill, 2008. Notice of this Bill was given on 1Oth October, 2008. The Bill was read a first time on 14th October, 2008. Hon. D. J. H. Thompson: To move the First Reading of the Land Tax (Amendment) Bill, 2008. Notice of this Bill was given on 31st October, 2008. The Bill was read a first time on 4th November, 2008. Hon. D. J. H. Thompson: To move the First Reading of the Profession Trade and Business Registration (Amendment) Bill, 2008. Hon. D. J. H. Thompson: To move the First Reading of the Special Loans (Amendment) Bill, 2008. Notice of this Bill was given on 14th November, 2008. 1. Will the Minister please state how many temporary or acting officers are entitled to be appointed since 15th January, 2008 under the Public Service Act, 2007? 2. Will the Minister please state how many of those temporary and acting officers are entitled to be appointed pursuant to the said Public Service Act? 3. Will the Minister please give a timeframe within which those said temporary or acting officers entitled to be appointed will be appointed? Notice of this Question was given on 3rd June, 2008. 1. Is the Minister aware that the confluence of roads at Lancaster, Orange Hill and Highway 2A presents a serious danger to motorists and other road users? (a) If the Minister is aware, will the Minister state what steps, if any, are being taken to address this danger? 2. Is the Minister aware that the intersection at Westmoreland near to Gamble Hill linking these areas to Highway 2A presents a serious danger to motorists and other road users? (a) If the Minister is aware, will the Minister state what measures, if any, he proposes to implement to address this danger? 3. Is the Minister aware that at Lower Rock Dundo and Gibbes, St. Peter the road is extremely narrow, thus posing a threat to motorists and other road users? (a) If the Minister is aware, will the Minister indicate what plans, if any, are there to widen the road and to eliminate this threat and how soon these plans will be implemented? 4. Is the Minister aware that even in light rains there is severe flooding at Trent's Tenantry in the parish of St. James? (a) If the Minister is aware, will the Minister state what plans, if any, he has to remedy this problem? 5. Is the Minister aware that the road near Eastry House, St. Peter is too narrow and consequently dangerous? (a) If the Minister is aware, will the Minister indicate what plans, if any, he has to address this problem? Notice of this Question was given on 1st October, 2008. On the motion of Hon. R. D. Jones, seconded by Dr. the Hon. D. C. Estwick, further consideration of matters was postponed.